Peoria (/piˈɔːriə/ pee-OR-ee-ə) is the county seat of Peoria County, Illinois, and the largest city on the Illinois River. Established in 1691 by the French explorer Henri de Tonti, Peoria is the oldest European settlement in Illinois, and is named after the Peoria tribe. As of the 2010 census, the city was the seventh-most populated in Illinois (and the third largest outside the Chicago metropolitan area), with a population of 115,007. The Peoria Metropolitan Statistical Area had a population of 373,590 in 2011. Until 2018, Peoria was the global and national headquarters for Caterpillar Inc., one of the 30 companies composing the Dow Jones Industrial Average, and listed on the Fortune 100; in the latter year, the company relocated its headquarters to Deerfield, Illinois. Peoria is one of the oldest settlements in Illinois, as explorers first ventured up the Illinois River from the Mississippi. The lands that eventually would become Peoria were first settled by Europeans in 1680, when French explorers René-Robert Cavelier, Sieur de La Salle and Henri de Tonti constructed Fort Crevecoeur. This fort would later burn to the ground, and in 1813 Fort Clark, Illinois was built. When the County of Peoria was organized in 1825, Fort Clark was officially named Peoria. Peoria was named after the Peoria tribe, a member of the Illinois Confederation. The original meaning of the word is uncertain. A 21st-century proposal suggests a derivation from a Proto-Algonquian word meaning "to dream with the help of a manitou." Peoria, Arizona, a suburb of Phoenix, was named after Peoria, Illinois because the two men who founded it in 1890 − Joseph B. Greenhut and Deloss S. Brown − wished to name it after their hometown. For much of the twentieth century, a red-light district of brothels and bars known as the Merry-Go-Round distinguished Peoria. Betty Friedan recalled driving through the neighborhood on dares during her high school years. Richard Pryor got his start as a performer on North Washington Street in the early 1960s. According to the 2010 census, Peoria has a total area of 50.23 square miles (130.10 km2), of which 48.01 square miles (124.35 km2) (or 95.58%) is land and 2.22 square miles (5.75 km2) (or 4.42%) is water. Peoria has a humid continental climate (Köppen Dfa), with cold, snowy winters, and hot, humid summers. Monthly daily mean temperatures range from 22.5 °F (−5.3 °C) to 75.2 °F (24.0 °C). Snowfall is common in the winter, averaging 26.3 inches (67 cm), but this figure varies considerably from year to year. Precipitation, averaging 36 inches (914 mm), peaks in the spring and summer, and is the lowest in winter. Extremes have ranged from −27 °F (−33 °C) in January 1884 to 113 °F (45 °C) in July 1936. The city of Peoria is home to a United States courthouse and the Peoria Civic Center (which includes Carver Arena). The world headquarters for Caterpillar Inc. was based in Peoria for over 110 years until announcing their move to Deerfield, Illinois in late 2017. Medicine has become a major part of Peoria's economy. In addition to three major hospitals, the USDA's National Center for Agricultural Utilization Research, formerly called the USDA Northern Regional Research Lab, is located in Peoria. This is one of the labs where mass production of penicillin was developed. Grandview Drive, which Theodore Roosevelt purportedly called the "world's most beautiful drive" during a 1910 visit, runs through Peoria and Peoria Heights. In addition to Grandview Drive, the Peoria Park District contains 9,000 acres (36 km2) of parks and trails. The Illinois River Bluff Trail connects four Peoria Park District parks: Camp Wokanda, Robinson Park, Green Valley Camp, and Detweiller Park, and the Rock Island Greenway (13 miles) connects to the State of Illinois Rock Island trail traveling north to Toulon, IL and also connects southeast to East Peoria, IL and to the Morton Community Bikeway. Other parks include the Forest Park Nature Center, which features seven miles of hiking trails through prairie openings and forested woodlands, Glen Oak Park, and Bradley Park, which features Frisbee golf as well as a dog park. Peoria has five public golf courses as well as several private and semi-private golf courses. The Peoria Park District, the first and still largest park district in Illinois, was the 2001 Winner of the National Gold Medal Award for Excellence in Parks and Recreation for Class II Parks. Museums in Peoria include the Pettengill-Morron House, the John C Flanagan House of the Peoria Historical Society, and the Wheels o' Time Museum. A new Museum Square, opened on October 12, 2012, houses the Peoria Riverfront Museum, a planetarium, and the Caterpillar World Visitors Center. The Peoria Art Guild hosts the Annual Art Fair, which is continually rated as one of the 100 top art fairs in the nation. Three cultural institutions are located in Glen Oak Park. The Peoria Zoo, formerly Glen Oak Zoo, was expanded and refurbished in recent years. Finished in 2009, the new zoo improvements more than triple the size of the zoo and feature a major African safari exhibit. Luthy Garden, established in 1951, encompasses five acres and offers over a dozen theme gardens and a Conservatory. The Peoria PlayHouse Children's Museum opened in June 2015 in the Glen Oak Pavilion. The Peoria Santa Claus Parade, which started in 1888, is the oldest running holiday parade in the United States. Peoria's sister cities include Friedrichshafen, Germany; Benxi, China; Clonmel, Ireland; and Aitou, Lebanon. Peoria Symphony Orchestra is the 10th oldest in the nation. Peoria is also home to the Peoria Municipal Band, the Peoria Area Civic Chorale, the Youth Music Illinois (formerly known as Central Illinois Youth Symphony), and the Peoria Ballet. Several community and professional theaters have their home in and around Peoria, including the Peoria Players, which is the fourth-oldest community theater in the nation and the oldest in Illinois. Corn Stock Theatre is another community theater company in Peoria, and is the only outdoor theater company in Central Illinois. Peoria has hosted the Heart of Illinois Fair every year since 1949. The fair features livestock competitions, rides, concessions, motor contests and concerts. The area has 14 commercial radio stations with six owners among them; four non-commercial full-power radio stations, each separately owned; five commercial television stations with two operating owners among them; one non-commercial television station; and one daily newspaper (Peoria Journal Star). NOAA Weather Radio station WXJ71 transmits from East Peoria and is licensed to NOAA's National Weather Service Central Illinois Weather Forecast Office at Lincoln, broadcasting on a frequency of 162.475 mHz (channel 4 on most newer weather radios, and most SAME weather radios). The station activates the SAME tone alarm feature and a 1050 Hz tone activating older radios (except for AMBER Alerts, using the SAME feature only) for hazardous weather and non-weather warnings and emergencies, along with selected weather watches, for the Illinois counties of Fulton, Knox, Marshall, Mason, McLean, Peoria, Putnam, Stark, Tazewell, and Woodford. Weather permitting, a tone alarm test of both the SAME and 1050 Hz tone features are conducted every Wednesday between 11 AM and noon. The Peoria Civic Center includes an arena, convention center, and theater, and was completed in the early 1980s, was designed by the famed late architect Philip Johnson. It completed a $55 million renovation and expansion by 2007. The Hotel Pere Marquette finished renovations in 2013 with a skyway linking to the Peoria Civic Center. A new 12-story Courtyard has been built adjacent to this hotel, completing a hotel campus for larger conventions. The Civic Center hosts the IHSA State Chess Championship, which claims to be the largest chess team tournament in the United States: Beginning in 2018, the teams were narrowed to 128 by the use of sectional elimination competitions, and as of 2018[update] the tournament has about 1500 players, including up to 8 players and 4 alternates per team. Renaissance Park was originally designated as a research park, originally established in May 2003 as the Peoria Medical and Technology District. It consisted of nine residential neighborhoods, Bradley University, the medical district, former location of the Caterpillar world headquarters, and the National Center for Agricultural Utilization Research. The Peoria NEXT Innovation Center opened in August 2007 and provides both dry and wet labs, as well as conference and office space for emerging start-up companies. Over $2 billion in research is conducted in Peoria annually. While the Renaissance Park research park project never came to full fruition, many of the original ideas from the original Renaissance Park concept still continue on a smaller level via The Renaissance Park Community Association. The Block is a $100+ million project that contains the Peoria Riverfront Museum and The Caterpillar Experience, a museum and visitor's center showcasing Caterpillar past, present, and future. It is located in downtown Peoria along the Illinois River at the site formerly known as the Sears Block. The Block opened in October 2012. Peoria became the first world leader for distilleries thanks to Andrew Eitle (1837) and Almiron S. Cole (1844). During this time, Peoria held 22 distilleries and multiple breweries. Together, they produced the highest amount of internal revenue tax on alcohol of any single revenue district in the entire U.S. Peoria also was one of the major bootlegging areas during Prohibition and home to the famed mobsters, the Shelton brothers. This great success placed Peoria into a building boom of beautiful private homes, schools, parks, churches, as well as municipal buildings. In addition to the distilleries came farm machinery manufacturing by William Nurse in 1837. Also, two men called Toby and Anderson brought the steel plow circa 1843, which gained immediate success. The dominant manufacturing companies in Peoria were Kingman Plow Co., Acme Harvester Co., Selby, Starr & Co., and Avery Manufacturing Co. In 1889, Keystone Steel & Wire developed the first wire fence and has since been the nation's leading manufacturer. The city's largest mall is Northwoods Mall. Other retail centers include The Shoppes at Grand Prairie, Sheridan Village, Metro Centre, and Willow Knolls Court. Bergner's − department store; started in 1889 in downtown Peoria and eventually bought out Carson Pirie Scott & Co.; now part of Bon-Ton. Bankrupt and closed nationwide August 2018. CEFCU − Credit union; started by Caterpillar employees; now serves residents of 14 counties in Central Illinois and 3 in California. As of the census of 2010, there were 115,021 people and 47,202 households residing in the city. The population density was 2,543.4 people per square mile (982.1/km²). There were 52,621 housing units. The racial makeup of the city was 62.4% White, 26.9% Black or African American, 0.3% Native American, 4.6% Asian, and 3.6% of mixed races. Hispanic or Latino of any race were 4.9% of the population. The city has a sizable, established Lebanese population with a long history in local business and government. The city population was 25.7% under the age of 18, 12.0% from 18 to 24, 27.2% from 25 to 44, 20.8% from 45 to 64, and 14.2% who were 65 years of age or older. The median age was 34 years. For every 100 females, there were 89.9 males. For every 100 females age 18 and over, there were 85.0 males. Special censuses were conducted in 2004 and 2007 that noted a total increase of 8,455 in the city's population since the 2000 census. Peoria is a home rule municipality with a mayor and ten city council members. It has a council-manager form of government. The city is divided into five districts. Five council members are elected at-large via cumulative voting. The Township of the City of Peoria (sometimes called City of Peoria Township) is a separate government from the City of Peoria, and performs the functions of civil township government in most of the city. The border of the township matched the Peoria city limits until 1991, when it was frozen at its current boundaries; the City of Peoria itself has continued expanding outside the City of Peoria Township borders into Kickapoo, Medina, and Radnor township. In the years before the freeze, the Township of the City of Peoria had grown to take up most of the former area of Richwoods and what is now West Peoria Township. Peoria Public Schools District 150 is the largest and serves the majority of the city. District 150 schools include dozens of primary and middle schools, as well as three public high schools: Richwoods High School, which hosts the competitive International Baccalaureate Program of study; Manual High School; and Peoria High School (Central), the oldest high school in Illinois. Until the end of the 2009–2010 school year, a fourth high school, Woodruff High School, closed. According to SchoolDigger, District 150 has the highest-ranking middle school (Washington Gifted Middle School). Peoria District 150 is also served by Quest Charter Academy, a STEM focused school serving grades 5-12. Quest is the only charter school in the area and began in 2010. Dunlap Community Unit School District 323 serves the far north and northwest parts of Peoria that were mostly outside the city before the 1990s. Dunlap schools has Dunlap High School, 2 Middle Schools and 5 Elementary schools. Limestone Community School District 310 serves a small portion of the western edge of the City of Peoria (western edges of Wardcliffe and Lexington Hills areas), but mainly serves the suburbs of Bartonville, Bellevue and surrounding towns. Peoria Heights School District 325 serves the suburb of Peoria Heights; however, parts of the City of Peoria immediately outside the Heights are in this school district. The health-care industry accounts for at least 25% of Peoria's economy. The city has three major hospitals: OSF Saint Francis Medical Center, UnityPoint Health – Methodist, and UnityPoint Health – Proctor. In addition, the Children's Hospital of Illinois, the University of Illinois College of Medicine at Peoria, and the Midwest Affiliate of St. Jude Children's Research Hospital are located in the city. The hospitals are all located in a medical district around the junction of Interstate 74 and Knoxville Avenue, adjacent to downtown in the southeast of the city, except for UnityPoint Health – Proctor in the geographic center of the city. The surrounding towns are also supported by UnityPoint Health – Proctor, Pekin Hospital, Advocate Eureka Hospital, and the Hopedale Medical Complex. The Institute of Physical Medicine and Rehabilitation was created from the "Peoria Plan for Human Rehabilitation," a model for medical and occupational rehabilitation launched in 1943 to integrate returning World War II veterans back into the workplace. In addition, U.S. Route 150 serves as the main arterial for the northern portion of the Peoria area, becoming War Memorial Drive before heading west towards Kickapoo. It enters from the McClugage Bridge; east of the bridge, U.S. 150 runs southeast to Morton. Illinois Route 6 runs along the northwestern portion of the city as an extension of I-474. It is a four-lane freeway that runs from the I-74/474 intersection northeast to Illinois Route 29 south of Chillicothe. It is marked as a north-south road. Illinois Route 8 roughly parallels I-74 to the south. It enters Peoria from Elmwood and runs southeast through the city, passing just southwest of the downtown area. Illinois 8 crosses into East Peoria via the Cedar Street Bridge with 116. Illinois 8 is marked as an east-west road. Illinois Route 29 runs through Peoria along the Illinois River from Chillicothe through downtown Peoria. It then joins Interstate 74 across the Murray Baker Bridge. Illinois 29 is marked as a north-south road, and is called Galena Road north of U.S. 150. Illinois Route 40 (formerly 88) enters Peoria from the north as Knoxville Avenue. It runs south through the center of the city and exits southeast over the Bob Michel Bridge. Illinois 40 is marked as a north-south road. Illinois Route 91 briefly enters Peoria at the intersection with U.S. 150 in the far northwestern portion of the city. Traffic on Illinois 91 mainly accesses the Shoppes at Grand Prairie, or continues to Dunlap. Illinois Route 116 enters from the west at Bellevue. It runs directly east and crosses into East Peoria over the Cedar Street Bridge. There is no passenger rail connecting Peoria to other urban centers, although this possibility and the possibility of rail service that connects St. Louis to Chicago (by way of Springfield, Peoria, Bloomington-Normal, and Pontiac) has been and is being investigated. Public bus service is provided by the Greater Peoria Mass Transit District, which operates 21 bus routes under the name CityLink, that serve the city, Illinois Central College and much of East Peoria, Illinois, Peoria Heights, West Peoria, and points between Peoria and Pekin. The General Wayne Downing Peoria International Airport is located west of Peoria. The airport is served by 4 passenger airlines (United, American, Delta, and Allegiant Air) and numerous cargo carriers. Nonstop destinations include Chicago, Atlanta, Dallas/Ft. Worth, Las Vegas, Minneapolis/St. Paul, Detroit, Houston, Phoenix, and Charlotte. Cargo carriers serving Peoria include UPS and Airborne Express (now DHL). Mount Hawley Auxiliary Airport, on the north end of the city, also accepts general aviation. Dr. Jokichi Takamine, lived in Peoria in the 1890s. Takamine family lives in a house at 2111 N. Jefferson St. The house is still visible at this address. Lydia Moss Bradley, founded Bradley University. October 16, 1854 – Abraham Lincoln first publicized his stand that the United States should move towards restricting and eventually eliminating slavery, a position directly against historic compromises such as the Kansas–Nebraska Act. The speech, which was possibly similar to one given in Springfield, Illinois, 12 days earlier, followed the speech of Stephen A. Douglas, whom Lincoln would later debate regularly in the Lincoln–Douglas debates of 1858. April 15, 1926 – Charles Lindbergh's first air mail route, Contract Air Mail route #2, began running mail from Chicago to Peoria to Springfield to St. Louis and back. There is nothing to substantiate the local legend that Lindbergh offered Peoria the chance to sponsor his trans-Atlantic flight and call his plane the "Spirit of Peoria," but he does state that he first pondered the journey after taking off from the Peoria air mail field. 1942 – Penicillium chrysogenum, the fungus originally used to industrially produce penicillin, was first isolated from a mouldy cantaloupe found in a grocery store in Peoria. April 3, 1967 – The trial of mass murderer Richard Speck begins at the Peoria County courthouse, after a change of venue from Chicago to ensure a fair trial. Theodore Roosevelt called Grandview Drive, a street on the bluffs overlooking the Illinois River "the world's most beautiful drive." The Peoria radio station and CBS television affiliate WMBD attached the description to its call sign. October 5, 1984 – Michael Jordan made his first appearance as a professional player (Chicago Bulls), in Peoria, in a preseason game against the Indiana Pacers. Jordan scored 18 points in 29 minutes in Chicago's 102–98 victory. Peoria has been awarded the All-America City Award four times (1953, 1966, 1989 and 2013). In 2007, Forbes ranked Peoria #47 out of the largest 150 metropolitan areas in its annual "Best Places for Business and Careers." Peoria was evaluated on the cost of doing business, cost of living, entertainment opportunities, and income growth. In 2005, Bert Sperling and Peter Sanders' "Best Places to Live Rankings" among 331 metropolitan areas placed Peoria #51, citing "low cost of living, low cost of housing, and attractive residential areas" as the main pros to the area. Peoria was ranked as one of the "50 Next Great Adventure Towns" in the US in the September 2008 issue of National Geographic Adventure magazine. This was mainly based on the extensive mountain biking trails in and around the city and the live entertainment options found on the RiverFront. In 2009, Peoria was ranked 16th best city with a population of 100,000−200,000 ("Mighty Micros") in the U.S. Next Cities List. The list was compiled by Next Generation Consulting, a firm which studies and consults on hiring trends and workplace issues nationwide, and the indexes used were divided into earning, learning, vitality, around town, after hours, cost of lifestyle and social capital. Top Mighty Micro was Fort Collins, Colorado; the other Mighty Micro in Illinois was Springfield at #5. In 2009, Peoria was ranked #5 best mid-sized city to launch a small business by CNN Money and Fortune Small Business. Milken Institute released its Best Performing Metropolitan Areas listing for 2008 and the Peoria Area ranked #33 among the top 200 largest metropolitan areas in the country. It was the highest ranking area in Illinois with Chicago coming in next at #148. The theme of Peoria as the archetypal example of middle American culture runs throughout American culture, appearing in movies and books, on television and radio, and in countless advertisements as either a filler place name, the representative of mainstream taste, hence the phrase "Will it play in Peoria?" On the Songs: Ohia album called The Magnilia Electric Co (2003) there is a song by Jason Molina called "Peoria Lunch Box Blues". In Sufjan Stevens' album Illinois, Peoria is the subject of the song titled "Prairie Fire That Wanders About." Stevens makes reference to multiple figures in Peoria's history, including Lydia Moss Bradley, and also speaks of Peoria's Santa Claus parade, the longest running in the nation. "Peoria" by King Crimson was recorded at The Barn in Peoria on March 10, 1972, included in the live album Earthbound. In 1977, the news magazine Time used Peoria as a form of "et cetera" in an article on the proliferation of new vineyards in America, calling them "the new Chateaux Peorias...."
A 2009 issue of National Geographic states in its "The Big Idea" section that electron-dispensing filling stations, a now-possible idea difficult to implement on a large scale, will soon "play even in Peoria". ^ "29 ZIP Code Results for listing Peoria, IL a "Primary city"". Unitedstateszipcodes.org. Archived from the original on June 7, 2015. Retrieved June 29, 2015. ^ a b "The First European Settlement in Illinois" (website). Peoria's History. Peoria, Illinois: Peoria Historical Society. Retrieved August 14, 2013. ^ "Cities with 25,000 population or more, table C-1: Area and Population". County and City Data Book: 2007. United States Census Bureau. 2007. Archived from the original on 2009-03-08. Retrieved 2009-03-12. ^ "Caterpillar to Move Headquarters to Chicago Suburb of Deerfield, Ill". Wall Street Journal. Retrieved 2017-07-05. ^ "Caterpillar's move to Deerfield made official in SEC filing". The State Journal-Register. Retrieved 2018-08-05. ^ Peoria Illinois History. peoria.com. Retrieved September 14, 2015. ^ Edward Callary, Place Names of Illinois (Urbana-Champaign: University of Illinois Press, 2009), p. 273. ^ "The History of Peoria, Arizona". City of Peoria, Arizona. Archived from the original on 2008-11-10. Retrieved 2008-11-09. ^ Slater, Wayne (2 November 1980). "Famed Brothels Gone, Prostitutes Remain: Play in Peoria Not Like in Old Days". Los Angeles Times. ^ Vanocur, Sander (20 March 1977). "Richard Pryor: It's a Long Way from Peoria--And It's Your Serve". The Washington Post. ^ "Average Weather for Peoria, IL − Temperature and Precipitation". The Weather Channel. Retrieved 2010-05-06. ^ "NowData – NOAA Online Weather Data". National Oceanic and Atmospheric Administration. Retrieved September 24, 2015. ^ "IL Peoria GTR Peoria AP". National Oceanic and Atmospheric Administration. Retrieved September 24, 2015. ^ "WMO Climate Normals for Peoria/Greater Peoria ARPT, IL 1961–1990". National Oceanic and Atmospheric Administration. Retrieved September 24, 2015. ^ Marotti, Lauren Zumbach, Ally. "Caterpillar bypasses Chicago, picks Deerfield for global headquarters". Chicagotribune.com. Retrieved 16 September 2018. ^ "Penicillin: Opening the Era of Antibiotics". National Center for Agricultural Utilization Research website. 2006-04-07. Archived from the original on 2011-07-21. Retrieved 2007-06-19. ^ "Alexander Fleming Discovery and Development of Penicillin - Landmark - American Chemical Society". American Chemical Society. Retrieved 16 September 2018. ^ "Welcome to the Peoria Park District, Peoria, Illinois, USA". Peoriaparks.org. Retrieved 2009-09-14. ^ "Before It Became Museum Square". InterBusinessIssues. January 2011. Retrieved 15 September 2014. ^ Tori Phelps. "Annual Fine Art Fair". PeoriaMagazines.com. Retrieved 2009-09-14. ^ Hatch, Danielle. "Say hello to Africa". Pjstar.com. Retrieved 16 September 2018. ^ "Top International Field Expected at Steamboat Classic 4 Mile". Cool Running. San Diego, California: The Active Network, Inc. 2006-06-15. Archived from the original on 2007-04-07. Retrieved 2007-06-19. ^ "Santa Claus Parade". PACE. Retrieved 3 June 2015. 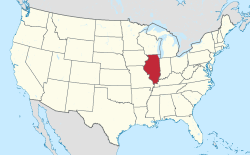 ^ "Sister City US Listings – Directory Search Results – Illinois". Washington, D.C.: Sister Cities International. Archived from the original on 2012-03-22. Retrieved 2011-04-25. ^ "Peoria Players History". 2007-03-19. Archived from the original on September 21, 2007. Retrieved 2007-06-19. ^ "A Peoria Tradition for Six Decades". Peoriamagazines.com. Retrieved 2014-02-06. ^ "Expo Gardens". expogardensinc.com. Retrieved 2019-03-12. ^ "Market Survey Schedule & Population Rankings" (PDF). Arbitron. 2011-09-12. Retrieved 2011-09-12. ^ "Local Television Market Universe Estimates: Comparisons of 2009–10 and 2010–11 Market Ranks" (PDF). New York City: The Neilsen Company. 2010-08-27. Retrieved 2011-01-15. ^ Lincoln, National Weather Service. "NOAA Weather Radio Station WXJ-71 (Peoria)". NOAA Weather Radio Station WXJ-71 (Peoria). Lincoln National Weather Service. Retrieved July 7, 2016. ^ "Pere Marquette reopens with a 'spectacular' new look". Peoria Journal Star. Retrieved 13 January 2019. ^ "2018 Chess" (Press release). Illinois High School Association. February 5, 2018. Retrieved 2019-01-03. ^ "Peoria Progress". Central Illinois Business Publishers. 2014. p. 14. ^ "Home". Peoria Riverfront Museum. Retrieved 2014-02-06. ^ "Visitors Center". Caterpillar. Retrieved 2014-02-06. ^ Ballance, Charles (1870). The History of Peoria, Illinois, pp. 127-28. N.C. Nason. ^ Ballance (1870), pp. 135-36. ^ "Peoria Historical Society". Peoriahistoricalsociety.org. Retrieved 16 September 2018. ^ "Northwoods Mall, a Simon Mall – Peoria, IL". Simon.com. Archived from the original on 2014-02-21. Retrieved 2014-02-06. ^ "The Shoppes at Grand Prairie". The Shoppes at Grand Prairie. Retrieved 16 September 2018. ^ "Metro Centre of Peoria Illinois - For Peoria by Peoria". Shopmetrocentre.com. Retrieved 16 September 2018. ^ "Komatsu America Corp. - Locations". Komatsuamerica.com. 2014-01-29. Retrieved 2014-02-06. ^ "City of Peoria CAFR" (PDF). Peoriagov.org. Retrieved 16 September 2018. ^ "Population and Housing Unit Estimates". Factfinder.census.gov. Retrieved June 9, 2017. ^ "Annual Estimates of the Resident Population for Incorporated Places of 50,000 or More, Ranked by July 1, 2014 Population: April 1, 2010 to July 1, 2014". American FactFinder. U.S. Census Bureau, Population Division. Archived from the original on 17 April 2016. Retrieved 22 May 2015. ^ "American FactFinder". United States Census Bureau. Archived from the original on 2012-07-29. Retrieved 2015-11-27. ^ Ardis, Jim (February 2008). "State of the City 2008". InterBusiness Issues. Peoria, Illinois: Central Illinois Business Publishers, Inc. Retrieved 2008-02-26. ^ "City of Peoria, Illinois". Ci.peoria.il.us. Retrieved 2014-02-06. ^ "Directions". Shoppesatgrandprairie.com. Retrieved 16 September 2018. ^ "CityLink maps". Greater Peoria Mass Transit District (CityLink). 2007-05-16. Archived from the original on 2007-07-09. Retrieved 2007-06-19. ^ "Peoria International Airport". Flypia.com. Retrieved 2014-02-06. ^ "Abraham Lincoln at Peoria, IL: The Turning Point". Lincolnatpeoria.com. 2009-06-18. Retrieved 2009-09-14. ^ Contract Air Mail Route No.2: Chicago − Peoria − Springfield − St. Louis Archived December 31, 2006, at the Wayback Machine. Includes images of Peoria-addressed and Peoria-postmarked postcards. Retrieved 2007-01-13. ^ Christopher Glenn (August 12, 2012). "Lindbergh Never Considered "Spirit of Peoria"". Peoria Journal Star Inc. Retrieved August 12, 2012. ^ "GRAND VIEW DRIVE AND PARK". Peoria Park District. Retrieved 2 May 2015. ^ "Forbes Ranks Peoria No. 47 on Cost of Doing Business Index". Economic Development Council for Central Illinois. Archived from the original on April 4, 2006. Retrieved 2007-08-31. ^ "2005 Best Places to Live". Sperling's Best Places. Retrieved 2007-08-31. ^ Glanton, Dahleen (2006-06-14). "America's best-mannered city" (PDF). Chicago Tribune. Archived from the original (PDF) on 2007-08-31. Retrieved 2007-08-31. Three Illinois cities − Peoria, Moline and Rock Island − have consistently made the Top 10. ^ "Best Places to Live: Where to Live and Play Now!". National Geographic Adventure. September 2008. ^ "Best Cities for Next Gen Workforce – What's more important than jobs?". Madison, Wisconsin: Next Generation Consulting. 2009-06-11. Archived from the original on 2009-06-14. Retrieved 2009-06-19. ^ "Best Places to Launch". CNN. ^ "2009 Best Performing Cities". Archived from the original on 2009-11-14. ^ "Will it Play in Peoria?". StoryCorps. Archived from the original on 13 July 2015. Retrieved 17 September 2014. ^ "Peoria, IL". Forbes. Retrieved 17 September 2014. ^ Borcover, Alfred (9 April 2010). "Play in Peoria". Chicago Tribune. Retrieved 17 September 2014. ^ "The Future of Filling Up". National Geographic. 15 October 2009. Retrieved 17 September 2014. ^ "These are the 5 worst cities for black Americans". USA TODAY. Retrieved 2018-11-17. ^ "The Worst Cities for Black Americans". 247wallst.com. Retrieved 2018-11-17. Wikisource has the text of an 1879 American Cyclopædia article about Peoria. "Peoria" . Encyclopædia Britannica (11th ed.). 1911.